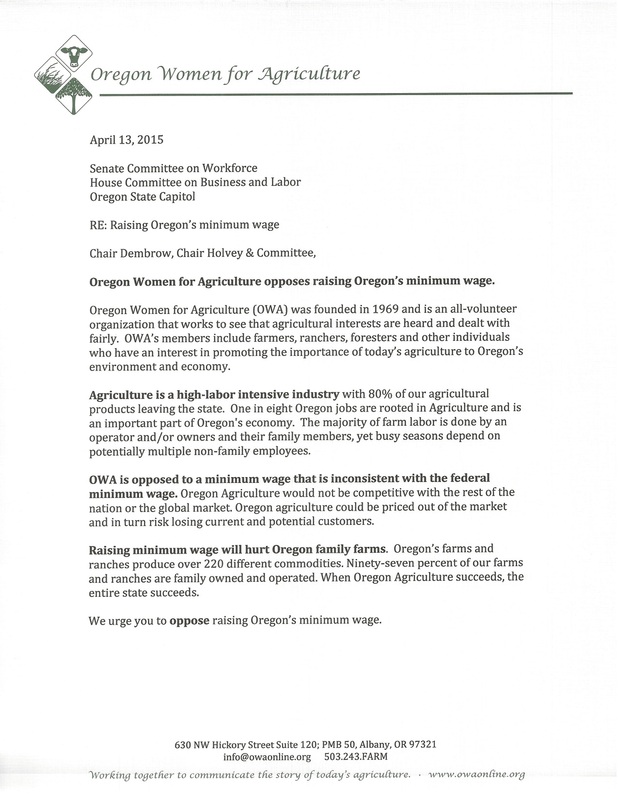 Oregon Women for Agriculture opposes raising Oregon’s minimum wage. Oregon Women for Agriculture (OWA) was founded in 1969 and is an all-volunteer organization that works to see that agricultural interests are heard and dealt with fairly. OWA’s members include farmers, ranchers, foresters and other individuals who have an interest in promoting the importance of today’s agriculture to Oregon’s environment and economy. Agriculture is a high-labor intensive industry with 80% of our agricultural products leaving the state. One in eight Oregon jobs are rooted in Agriculture and is an important part of Oregon’s economy. The majority of farm labor is done by an operator and/or owners and their family members, yet busy seasons depend on potentially multiple non-family employees. OWA is opposed to a minimum wage that is inconsistent with the federal minimum wage. Oregon Agriculture would not be competitive with the rest of the nation or the global market. Oregon agriculture could be priced out of the market and in turn risk losing current and potential customers. Raising minimum wage will hurt Oregon family farms. Oregon’s farms and ranches produce over 220 different commodities. Ninety-seven percent of our farms and ranches are family owned and operated. When Oregon Agriculture succeeds, the entire state succeeds. We urge you to oppose raising Oregon’s minimum wage.